Oil tankers are marine vessels that transport oil to and from ports and terminals. Spills can occur during the process of loading or transporting oil, or while waiting to complete either of these activities. Spills range from small personal vessel leaks to large-scale commercial spills of a million gallons or more. These oil spills are difficult to clean up and have negative effects on the environment, wildlife, and human life. On this page, you will find information on historic spills, environmental impacts, improvements in the design of tankers, and causes for collisions. What are Oil Tankers? and How have they Improved? Oil tankers are marine vessels that transport refined and unrefined petroleum products. Oil tankers have been around for over 100 years, with the first successful commercial oil tanker being the Zoroaster. The Zoroaster set sail in 1878 in the Caspian Sea, and held approximately 1,872 barrels of crude oil. Today, tankers can hold up to 3.7 million barrels of crude oil (Marine Insight). As illustrated below, tankers in production today range from General Purpose tankers to Ultra Large Crude Carrier (ULCC) tankers (EIA). Since their invention in the late 1800s, tanker structures have been vastly improved. When tankers first went commercial, they had only a single hull – a compartment where the oil is kept. This meant that only the outside layer of the vessel divided the oil from the open ocean. However, manufacturers realized how risky this design was in the late 20th century, and started manufacturing vessels with double hulls. The manufacturing of tankers with double hulls was enforced in 1990 after the 1998 Exxon Valdez Oil Spill in Alaska. The enforcement of double hulls in all active vessels was implemented in the beginning of 2015 (NOAA). It is commonly believed that tanker spills occur by vessels running into obstacles in the water, such as sandbars or icebergs. While this does happen, many spills transpire due to mechanical failures, loss of steering control, and loss of power (Black Tides). There are many small-scale spills that happen daily, most of which are due to personal boating leakages. However, a few catastrophic spills are worth recounting. The largest tanker spill in United States history was the Exxon Valdez tanker spill in Alaska’s Prince William Sound in March 1989. The spill occurred when one of Exxon’s oil tankers ran aground off a remote beach in Prince William Sound. This location was only accessible by boat and helicopter, which made the oil cleanup process delayed, and very difficult (EPA). The Exxon Valdez spill had a catastrophic impact on the environment and wildlife of the Sound and surrounding areas (Associated Press). Because this spill was the largest in U.S. history, there were many studies done on the impacts of the spill. Many of these studies were revisited and updated during the spill’s 25-year anniversary in 2014. Another oil spill that should be highlighted is the Deepwater Horizon spill, the largest oil spill ever recorded. This British Petroleum (BP) spill was not a tanker spill, but an explosion of an offshore drilling site. This spill happened in the Gulf of Mexico at an offshore drilling site south of the Louisiana coast. Approximately 210 million gallons leaked into the Gulf, almost 200 million more gallons than the Exxon spill in Alaska (Griffin). Both of these spills had devastating impacts on the environment, with impacts that are still being felt today. Oil spills have many adverse effects on the environment and on its inhabitants, as do the spill cleanup methods. The majority of oil from an oil spill will typically float to the water’s surface, so the most impacted species are birds and mammals that inhabit the body of water’s surface level (NOAA 2016). Seabirds are generally the most impacted by oil spills, because the oil can coat the birds’ feathers, irritate the eyes, and cause internal harm like kidney and liver damage when ingested. When the oil coats the animal’s fur or feathers, it disturbs their ability to control their temperature, which can lead to the animal either overheating or freezing. Birds, who frequently preen themselves, are also at high risk for ingesting the toxic oil, which then affects their organs and immune system (U.C. Davis). Oil also affects animals living beneath the water’s surface, and species living on the shoreline. Oil can smother animals and organisms resting on the sea floor and on shore, as well as poison animals and plants due to the toxicity of the substance (NOAA 2016). The oil spill cleanup methods themselves can have harmful impacts on the environment and species at spill sites. One form of cleanup technology that is commonly used for oil spills are dispersants, a type of chemical compound. Dispersants ake the oil sink below the water’s surface so the oil does not reach and impact the shorefront, or impact the species that inhabit the surface level of the water. While dispersants can have positive effects, they can also have negative effects on the ecosystems of cleanup zones. As chemical compounds, dispersants are toxic and can poison wildlife. Dispersants are highly detrimental to fish eggs and other species that live on the seafloor, because of their desire to sink. Dispersants are also a major risk to corals, humans, birds, and marine mammals because of their inherent toxicity (CBD). No matter what kind of cleanup method is used, whether it be dispersants, or mechanical cleanup methods such as booms and skimmers, much of the oil will still remain in the affected ecosystem. As of 2010, at least 21,000 gallons of oil still remained in the location of the 1989 Exxon Valdez spill in Alaska (Holba). Associated Press. (2002, January 23). Toxic effects of Exxon Valdez Spill linger on. Seattle Post-Intelligencer. Black Tides. (n.d.). Causes of accidents. Black Tides. Center for Biological Diversity (CBD). (n.d.). Dispersants. Center for Biological Diversity. Griffin, D., Black, N., & Devine, C. (2015, April 20). 5 years after the Gulf oil spill: What we do (and don’t) know. Cable News Network. Holba, C. (2014, March 24). Exxon Valdez Oil Spill. Alaska Resources Library & Information Services. Marine Insight. (2012, December 18). Zoroaster: The world's first tanker ship. MI News Network. National Oceanic and Atmospheric Administration (NOAA). (2015, December 3). Final farewell to oil tankers with single hulls. Office of Response and Restoration. National Oceanic and Atmospheric Administration (NOAA). (2016, February 9, 2016). How oil harms animals and plants in marine environments. Office of Response and Restoration. National Wildlife Federation (NWF). (n.d.). How does the BP oil spill impact wildlife and habitat? NWF. U.S. Energy Information Administration (EIA). (2014, September 16). 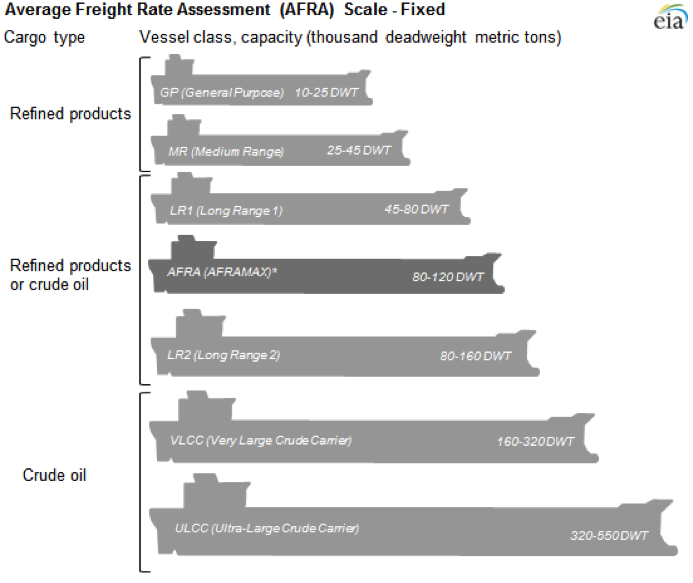 Oil tanker sizes range from general purpose to ultra-large crude carriers on AFRA scale.Today in Energy EIA. United States Environmental Protection Agency (EPA). (2015, April 14). Exxon Valdez spill profile. EPA. University of California Davis Veterinary Medicine (U.C. Davis). (n.d.). Impacts of Oil on Seabirds. Oiled Wildlife Care Network.